Yes, I know, as many readers will be quick to inform me, the West never had any morality. Nevertheless things have gotten worse. In hopes that I will be permitted to make a point, permit me to acknowledge that the US dropped nuclear bombs on two Japanese cities, fire-bombed Tokyo, that Great Britain and the US fire-bombed Dresden and a number of other German cities, expending more destructive force, according to some historians, against the civilian German population than against the German armies, that President Grant and his Civil War war criminals, Generals Sherman and Sheridan, committed genocide against the Plains Indians, that the US today enables Israel’s genocidal policies against the Palestinians, policies that one Israeli official has compared to 19th century US genocidal policies against the American Indians, that the US in the new 21st century invaded Iraq and Afghanistan on contrived pretenses, murdering countless numbers of civilians, and that British prime minister Tony Blair lent the British army to his American masters, as did other NATO countries, all of whom find themselves committing war crimes under the Nuremberg standard in lands in which they have no national interests, but for which they receive an American pay check. I don’t mean these few examples to be exhaustive. I know the list goes on and on. Still, despite the long list of horrors, moral degradation is reaching new lows. The US now routinely tortures prisoners, despite its strict illegality under US and international law, and a recent poll shows that the percentage of Americans who approve of torture is rising. Indeed, it is quite high, though still just below a majority. And we have what appears to be a new thrill: American soldiers using the cover of war to murder civilians. Recently American troops were arrested for murdering Afghan civilians for fun and collecting trophies such as fingers and skulls. This revelation came on the heels of Pfc. Bradley Manning’s alleged leak of a US Army video of US soldiers in helicopters and their controllers thousands of miles away having fun with joy sticks murdering members of the press and Afghan civilians. Manning is cursed with a moral conscience that has been discarded by his government and his military, and Manning has been arrested for obeying the law and reporting a war crime to the American people. US Rep. Mike Rogers, a Republican, of course, from Michigan, who is on the House Subcommittee on Terrorism, has called for Manning’s execution. According to US Rep. Rogers it is an act of treason to report an American war crime. US Rep. Rogers said that America’s wars are being undermined by “a culture of disclosure” and that this “serious and growing problem” could only be stopped by the execution of Manning. If Rep. Rogers is representative of Michigan, then Michigan is a state that we don’t need. The US government, a font of imperial hubris, does not believe that any act it commits, no matter how vile, can possibly be a war crime. One million dead Iraqis, a ruined country, and four million displaced Iraqis are all justified, because the “threatened” US Superpower had to protect itself from nonexistent weapons of mass destruction that the US government knew for a fact were not in Iraq and could not have been a threat to the US if they were in Iraq. When other countries attempt to enforce the international laws that the Americans established in order to execute Germans defeated in World War II, the US government goes to work and blocks the attempt. A year ago on October 8, the Spanish Senate, obeying its American master, limited Spain’s laws of universal jurisdiction in order to sink a legitimate war crimes case brought against George W. Bush, Barack H. Obama, Tony Blair,and Gordon Brown. The West includes Israel, and there the horror stories are 60 years long. Moreover, if you mention any of them you are declared to be an anti-semite. I only mention them in order to prove that I am not anti-American, anti-British, and anti-NATO, but am simply against war crimes. It was the distinguished Zionist Jewish Judge, Goldstone, who produced the UN report indicating that Israel committed war crimes when it attacked the civilian population and civilian infrastructure of Gaza. For his efforts, Israel declared the Zionist Goldstone to be “a self-hating Jew,” and the US Congress, on instruction from the Israel Lobby, voted to disregard the Goldstone Report to the UN. 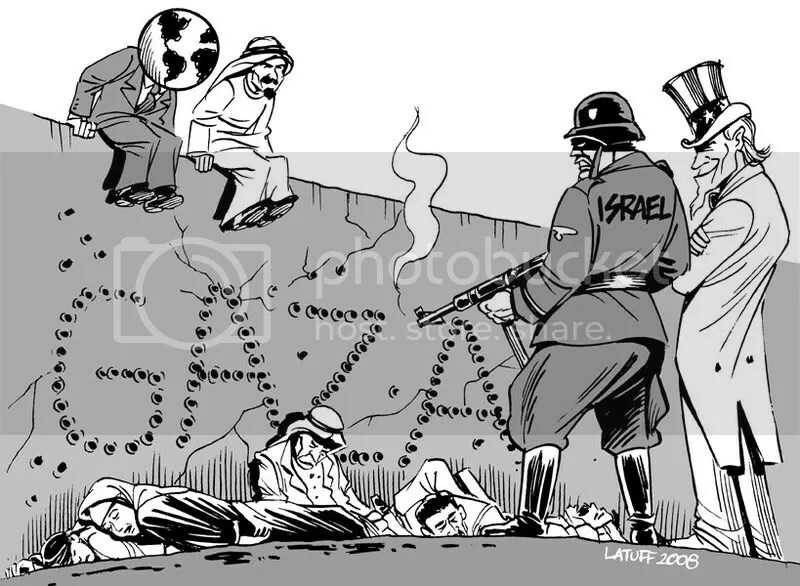 As the Israeli official said, we are only doing to the Palestinians what the Americans did to the American Indians. The Israeli army uses female soldiers to sit before video screens and to fire by remote control machine guns from towers to murder Palestinians who come to tend their fields within 1500 meters of the inclosed perimeter of Ghetto Gaza. There is no indication that these Israeli women are bothered by gunning down young children and old people who come to tend to their fields. If the crimes were limited to war and the theft of lands, perhaps we could say it is a case of jingoism sidetracking traditional morality, otherwise still in effect. Alas, the collapse of morality is too widespread. Some sports teams now have a win-at-all-cost attitude that involves plans to injure the star players of the opposing teams. To avoid all these controversies, let’s go to Formula One racing where 200 mph speeds are routine. Prior to 1988, 22 years ago, track deaths were due to driver error, car failure, and poorly designed tracks compromised with safety hazards. World Champion Jackie Stewart did much to improve the safety of tracks, both for drivers and spectators. But in 1988 everything changed. Top driver Ayrton Senna nudged another top driver Alain Prost toward a pit wall at 190 mph. According to AutoWeek (August 30, 2010), nothing like this had been seen before. “Officials did not punish Senna’s move that day in Portugal, and so a significant shift in racing began.” What the great racing driver Stirling Moss called “dirty driving” became the norm. Nigel Roebuck in AutoWeek reports that in 1996 World Champion Damon Hill said that Senna’s win-at-all-cost tactic “was responsible for fundamental change in the ethics of the sport.” Drivers began using “terrorist tactics on the track.” Damon Hill said that “the views that I’d gleaned from being around my dad [twice world champion Graham Hill] and people like him, I soon had to abandon,” because you realized that no penalty was forthcoming against the guy who tried to kill you in order that he could win. In today’s Western moral climate, driving another talented driver into the wall at 200 mph is just part of winning. Michael Schumacher, born in January 1969, is a seven times World Champion, an unequaled record. On August 1 at the Hungarian Grand Prix, AutoWeek Reports that Schumacher tried to drive his former Ferrari teammate, Rubens Barrichello, into the wall at 200 mph speeds. Neither does the US government, nor state and local governments, nor the UK government, nor the EU. The police have been off the leash since the civilian police boards were nixed by the conservatives. Kids as young as 6 years old have been handcuffed and carted off to jail for school infractions that may or may not have occurred. So have moms with a car full of children (see, for example, http://www.youtube.com/watch?v=4AaSLERx0VM ). Anyone who googles videos of US police gratuitous brutality will call up tens of thousands of examples, and this is after laws that make filming police brutality a felony. A year or two ago such a search would call up hundreds of thousands of videos. In one of the most recent of the numerous daily acts of gratuitous police abuse of citizens, an 84-year-old man had his neck broken because he objected to a night time towing of his car. The goon cop body-slammed the 84-year old and broke his neck. The Orlando, Florida, police department says that the old man was a “threat” to the well-armed much younger police goon, because the old man clenched his fist. The Israel Defense Forces prosecution on Thursday filed an indictment against two combat soldiers suspected of inappropriate conduct during Israel’s offensive in the Gaza Strip in 2008. The soldiers, who served as staff sergeants in the Givati Brigade during Operation Cast Lead, allegedly forced a 9-year-old Palestinian boy to open a number of bags they thought might contain explosive materials. The bags turned out to be harmless. The soldiers, who breached the army’s rule against using civilians as human shields during war, will be tried for violating their authority and for inappropriate conduct. An Israeli military official said the soldiers could face up to three years in jail. The incident in question occurred in the Tel Al-Hawa neighborhood in south Gaza City in January 2009, toward the end of the war. The military said it opened the investigation after the incident was brought to its attention by the United Nations, but emphasised it was “completely unrelated” to a report issued by United Nations investigator Richard Goldstone. Israel has said it opened 36 criminal investigations into complaints of improper conduct by its troops during the fighting with Hamas gunmen, much of which occurred in residential areas. Last month a senior Israeli field officer in the Gaza war was reprimanded over artillery shelling in a heavily populated area that hit a United Nations compound during the fighting. In a separate incident earlier Thursday, the military court ordered the release of Adam Malul, an IDF officer convicted in December on charges of aggravated assault and conduct unbecoming an officer after hitting a Palestinian in the West Bank. In sentencing the officer, 1st Lt. (res.) Adam Malul of the Kfir infantry brigade, the court ruled that he had already served a sufficient punishment after spending 64 days in jail and a further 32 days under house arrest. The court also rejected a request by the prosecution to demote Malul to the rank of private. Malul was convicted in of hitting a man while making an arrest in the West Bank village of Kadum in September 2008. In its December verdict, the court rejected testimony by a former commander of the Kfir infantry brigade, Col. Itai Virob, and a former commander of the Shimshon unit, Lt. Col. Shimon Harush, in which they justified hitting Palestinian detainees under exceptional circumstances. Malul’s family has said that the trial was a smear campaign against him and accused the court of scape-goating him while acquitting his superiors. During his trial, Malul testified that he was not ashamed of hitting the Palestinian man, saying, “It was what I had to do”. However, GOC Central Command Gadi Shamni testified during the military trial that IDF soldiers were not authorized to attack Palestinian civilians during arrest raids, adding that those who cross the army’s “red lines” must be put to trial. Shamni added that the IDF never authorized the use of such aggression during questioning of detainees. THE TWO classic intelligence disasters occurred during World War II. In both, the intelligence agencies either provided their political bosses with faulty assessments, or the leaders ignored their accurate assessments. As far as the results are concerned, both amount to the same. Comrade Stalin was totally surprised by the German invasion of the Soviet Union, even though the Germans needed months to assemble their huge invasion force. President Roosevelt was totally surprised by the Japanese attack on Pearl Harbor, even though the bulk of the Japanese Navy took part in it. The failures were so fantastic, that spy aficionados had to resort to conspiracy theories to explain them. One such theory says that Stalin deliberately ignored the warnings because he intended to surprise Hitler with an attack of his own. Another theory asserts that Roosevelt practically “invited” the Japanese to attack because he was in need of a pretext to push the US into an unpopular war. But since then, failures continued to follow each other. All Western spy agencies were totally surprised by the Khomeini revolution in Iran, the results of which are still hitting the headlines today. All of them were totally surprised by the collapse of the Soviet Union, one of the defining events of the 20th century. They were totally surprised by the fall of the Berlin wall. And all of them provided wrong information about Saddam Hussein’s imaginary nuclear bomb, which served as a pretext for the American invasion of Iraq. Really? At the outbreak of the 1948 war, all the chiefs of our intelligence community unanimously advised David Ben-Gurion that the armies of the Arab states would not intervene. (Fortunately, Ben-Gurion rejected their assessment.) In May 1967, our entire intelligence community was totally surprised by the concentration of the Egyptian army in Sinai, the step that led to the Six-Day war. (Our intelligence chiefs were convinced that the bulk of the Egyptian army was busy in Yemen, where a civil war was raging.) The Egyptian-Syrian attack on Yom Kippur, 1973, completely surprised our intelligence services, even though heaps of advance warnings were available. The intelligence agencies were totally surprised by the first intifada, and then again by the second. They were totally surprised by the Khomeini revolution, even though (or because) they were deeply imbedded in the Shah’s regime. They were totally surprised by the Hamas victory in the Palestinian elections. STEVEN SPIELBERG’S movie “Munich” describes the assassination (“elimination”) of PLO officials after the massacre of the athletes at the Olympic Games. As a masterpiece of kitsch it can be compared only to the movie “Exodus”, based on Leon Uris’ kitschy book. After the massacre (the main responsibility for which falls on the incompetent and irresponsible Bavarian police), the Mossad, on the orders of Golda Meir, killed seven PLO officials, much to the joy of the revenge-thirsty Israeli public. Almost all the victims were PLO diplomats, the civilian representatives of the organization in European capitals, who had no direct connection with violent operations. Their activities were public, they worked in regular offices and lived with their families in residential buildings. They were static targets – like the ducks in a shooting gallery. In one of the actions – which resembled the latest affair – a Moroccan waiter was assassinated by mistake in the Norwegian town of Lillehammer. The Mossad mistook him for Ali Hassan Salameh, a senior Fatah officer who served as contact with the CIA. The Mossad agents, including a glamorous blonde (there is always a glamorous blonde) were identified, arrested and sentenced to long prison terms (but released very soon). The real Salameh was “eliminated” later on. In 1988, five years before the Oslo agreement, Abu Jihad (Khalil al-Wazir), the No. 2 in Fatah, was assassinated in Tunis before the eyes of his wife and children. Had he not been killed, he would probably be serving today as the President of the Palestinian Authority instead of Abu Mazen (Mahmoud Abbas). He would have enjoyed the same kind of standing among his people as did Yasser Arafat – who was, most likely, killed by a poison that leaves no traces. The fiasco that most resembles the latest action was the Mossad’s attempt on the life of Khalid Mishal, a senior Hamas leader, on orders of Prime Minister Binyamin Netanyahu. The Mossad agents ambushed him on a main street of Amman and sprayed a nerve toxin in his ear – that was about to kill him without leaving traces. They were caught on the spot. King Hussein, the Israeli government’s main ally in the Arab world, was livid and delivered a furious ultimatum: either Israel would immediately provide the antidote to the poison and save Mishal’s life, or the Mossad agents would be hanged. Netanyahu, as usual, caved in, Mishal was saved and the Israeli government, as a bonus, released Sheik Ahmed Yassin, the main Hamas leader, from prison. He was “eliminated” by a hellfire missile later on. DURING THE last weeks, a deluge of words has been poured on the assassination in Dubai of Mahmoud al-Mabhouh, another senior Hamas officer. Israelis agreed from the first moment that this was a job of the Mossad. What capabilities! What talent! How did they know, long in advance, when the man would go to Dubai, what flight he would take, in what hotel he would stay! What precise planning! The “military correspondents” and “Arab affairs correspondents” on screen were radiant. Their faces said: oh, oh, oh, if the material were not embargoed…If I could only tell you what I know…I can tell you only that the Mossad has proved again that its long arm can reach anywhere! Live in fear, oh enemies of Israel! When the problems started to become apparent, and the photos of the assassins appeared on TV all over the world, the enthusiasm cooled, but only slightly. An old and proven Israeli method was brought into play: to take some marginal detail and discuss it passionately, ignoring the main issue. Concentrate on one particular tree and divert attention from the forest. Really, why did the agents use the names of actual people who live in Israel and have dual nationality? Why, of all possible passports, did they use those of friendly countries? How could they be sure that the owners of these passports would not travel abroad at the critical time? Moreover, were they not aware that Dubai was full of cameras that record every movement? Did they not foresee that the local police would produce films of the assassination in almost all its details? But this did not arouse too much excitement in Israel. Everybody understood that the British and the Irish were obliged, pro forma, to protest, but that this was nothing but going through the motions. Behind the scenes, there are intimate connections between the Mossad and the other intelligence agencies. After some weeks, everything will be forgotten. That’s how it worked in Norway after Lillehammer, that’s how it worked in Jordan after the Mishal affair. They will protest, rebuke, and that’s that. So what is the problem? THE PROBLEM is that the Mossad in Israel acts like an independent fiefdom that ignores the vital long-term political and strategic interests of Israel, enjoying the automatic backing of an irresponsible prime minister. It is, as the English expression goes, a “loose cannon” – the cannon of a ship of yore which has broken free of its mountings and is rolling around the deck, crushing to death any unfortunate sailor who happens to get in its way. From the strategic point of view, the Dubai operation causes heavy damage to the government’s policy, which defines Iran’s putative nuclear bomb as an existential threat to Israel. The campaign against Iran helps it to divert the world’s attention from the ongoing occupation and settlement, and induces the US, Europe and other countries to dance to its tune. Barack Obama is in the process of trying to set up a world-wide coalition for imposing “debilitating sanctions” on Iran. The Israeli government serves him – willingly – as a growling dog. He tells the Iranians: The Israelis are crazy. They may attack you at any moment. I am restraining them with great difficulty. But if you don’t do what I tell you, I shall let go of the leash and may Allah have mercy on your soul! Dubai, a Gulf country facing Iran, is an important component of this coalition. It is an ally of Israel, much like Egypt and Jordan. And here comes the same Israeli government and embarrasses it, humiliates it, arousing among the Arab masses the suspicion that Dubai is collaborating with the Mossad. In the past we have embarrassed Norway, then we infuriated Jordan, now we humiliate Dubai. Is that wise? Ask Meir Dagan, who Netanyahu has just granted an almost unprecedented eighth year in office as chief of the Mossad. PERHAPS THE impact of the operation on Israel standing in the world is even more significant. Once upon a time it was possible to belittle this aspect. Let the Goyim say what they want. But since the Molten Lead operation, Israel has become more conscious of its far-reaching implications. The verdict of Judge Goldstone, the echoes of the antics of Avigdor Lieberman, the growing world-wide campaign for boycotting Israel – all these tend to suggest that Thomas Jefferson was not talking through his hat when he said that no nation can afford to ignore the opinion of mankind. The Dubai affair is reinforcing the image of Israel as a bully state, a rogue nation that treats world public opinion with contempt, a country that conducts gang warfare, that sends mafia-like death squads abroad, a pariah nation to be avoided by right-minded people. The Israelis have a lot of experience dealing with asymmetrical warfare. But they’re not exactly used to its latest manifestation, which could be coming to a college campus near you. Committed activists let their frustrations be heard on Monday in two separate lectures delivered by senior Israeli diplomats. While the videos go viral among students, its watching the tactics used at these events that must be leaving Israel unnerved. Consider the way in which a mockery was made of Israel’s Ambassador to the U.S. Michael Oren, who presented at the University of California at Irvine. The heckling made it impossible for Oren to carry on, and persisted in spite of pleas and threats by audience members and promises of arrest by the rattled college rector. Most of Oren’s detractors made reference to Israel’s actions during the 2009 Gaza War. Israel is under heavy strain by UN officials and international rights organizations to be held accountable for crimes of war during the 17-day Israeli assault on Gaza. Some from academia have defended Israel from the charges, including Harvard’s Alan Dershowitz, who went so far as to attack UN Investigator Richard Goldstone with a provocative Hebrew word that translates as “traitor to the Jewish people”. Lancet editorial accuses NGOs of putting their own interests above those of the quake victims whom they claim to help. Aid agencies have been accused of “jostling for position” and putting their own interests above those of the victims in the Haiti earthquake. In a caustic editorial today, the respected medical journal, the Lancet, attacked the way charities and other non-governmental organisations have clamoured for attention in the wake of the disaster. “NGOs are rightly mobilising, but also jostling for position, each claiming that they are doing the most for earthquake survivors,” it said. The Lancet did not name any aid agencies, many of which lost staff members in the disaster, but it questioned the way several have claimed to be “spearheading” relief efforts. “As we only too clearly see, the situation in Haiti is chaotic, devastating, and anything but co-ordinated,” it said. The editorial argued that the response to the earthquake has highlighted questions about the competitive ethos of large aid agencies. The issue has emerged in past emergencies, including the Asian tsunami in 2004. “Polluted by the internal power politics and the unsavoury characteristics seen in many big corporations, large aid agencies can be obsessed with raising money through their own appeal efforts. Media coverage as an end in itself is too often an aim of their activities,” it said. Worse still, it accused aid agencies of acting selfishly to the detriment of those they were supposed to be helping. “It seems increasingly obvious that many aid agencies sometimes act according to their own best interests rather than in the interests of individuals whom they claim to help,” the Lancet said. It urged aid agencies to do more to collaborate in response to disasters rather than compete for attention. “Relief efforts in the field are sometimes competitive with little collaboration between agencies, including smaller, grassroots charities that may have better networks in affected counties and so are well-placed to immediately implement emergency relief,” it said. The editorial said the response to the earthquake should prompt a review of aid agencies and the way they deliver aid. Since the disaster some countries and aid agencies have criticised the way the US military has led the relief effort. The Lancet editorial was the most sustained criticism to date of the way the aid agencies themselves have reacted. Andrew Hogg, campaigns editor for Christian Aid, rejected the criticism and detailed the collaboration of the charity with other international NGOs and local groups. She also pointed out that the work of the Disasters Emergency Committee, an umbrella group of NGOs which has raised £38m for Haiti in the UK, helps to overcome competition between agencies. Brendan Gormley, chief executive of the Disasters Emergency Committee, said the claim that aid agencies had lost their humanitarianism ethos was “risible”. The Lancet had failed to “take into account the huge efforts by dedicated staff and volunteers – both Haitians and international experts – who are working tirelessly to bring help to earthquake survivors”. A spokeswoman for Médecins Sans Frontières conceded that the Lancet had some “valid points” but in a statement MSF said: “Tragically we lost a number of our national staff in the earthquake. Our three health facilities were damaged. But the fact that we already had 800 national staff and 30 international experts working in Haiti meant we were able to start helping survivors 25 minutes after the earthquake struck. Beacon of light in Haiti! A few days before Israeli physicians rushed to save the lives of injured Haitians, the authorities at the Erez checkpoint prevented 17 people from passing through in order to get to a Ramallah hospital for urgent corneal transplant surgery. Perhaps they voted for Hamas. At the same time that Israeli psychologists are treating Haiti’s orphans with devotion, Israeli inspectors are making sure no one is attempting to plant a doll, a notebook or a bar of chocolate in a container bringing essential goods into Gaza. So what if the Goldstone Commission demanded that Israel lift the blockade on the Strip and end the collective punishment of its inhabitants? Only those who hate Israel could use frontier justice against the first country to set up a field hospital in Haiti.